Everyone can sustain a Sport Injury. 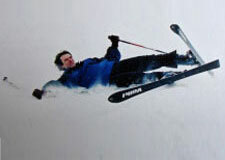 Sport accident occurs, when a person is skiing or skating, snowboarding or swimming, playing golf or basketball. A victim of a sport accident may sustain different types of injuries: from simple bruises to complicated Brain Injury and Spinal Cord Injury. Sport related injuries usually include broken bones, tears and concussions, often accompanied by headaches, vertigo and neck pain. In some cases a Sport Injury can result in the death of the injured person.